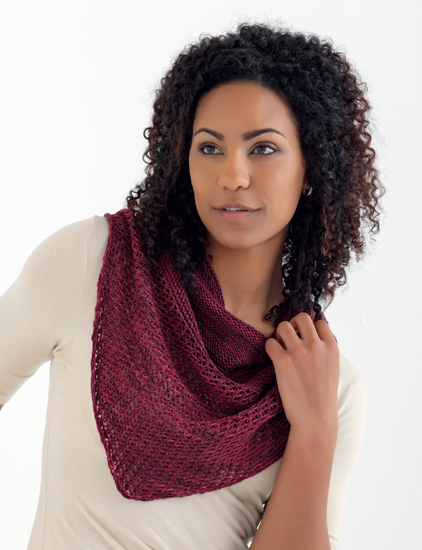 Best-selling author Jen Lucas presents an all-new selection of striking patterns for luscious sock yarns, following the overwhelming success of Sock-Yarn Shawls. 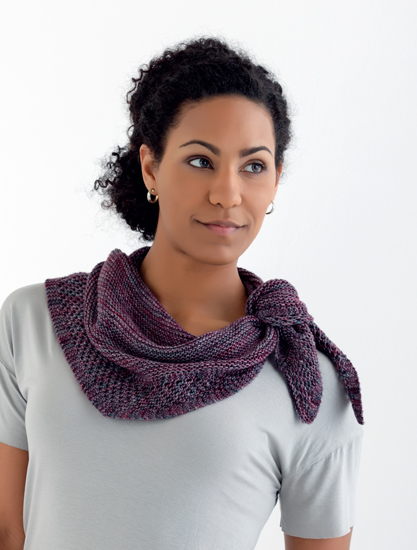 Discover designs for everyone from confident beginners to advanced knitters. Patterns range from small shawlettes to large circular shawls, and many are made from a single skein. 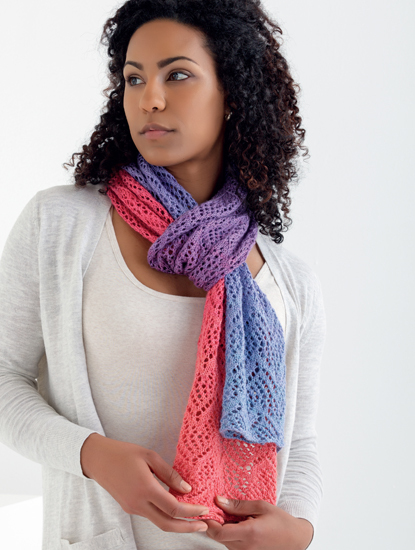 Video: Jen Lucas shows you how to knit a circular cast on. 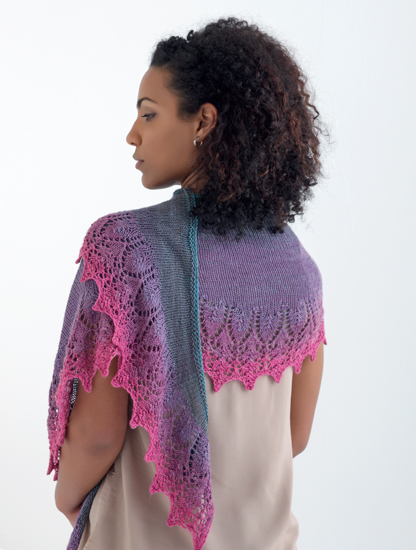 The designs included in Sock Yarn Shawls II are gorgeous and the patterns are wonderfully written. I love how the book is broken down into Small Shawls, Midsize Shawls, and Large Shawls. I also love that there is a section for special techniques and tips for choosing the right yarn. All of the designs are gorgeous but I especially love Sierra, Monarda, and Lycopod. I would definitely recommend this book to anyone that love to knit! 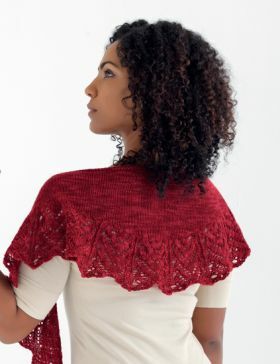 Made just about every lace shawl in the first book - want to make 'Lycopod' in the second book, but can't find any instructions as to chart repeats to make the size shown. Any suggestions? Hi Trudy, thanks for your question. This particular shawl is worked in halves, and all of the instructions you need to make it are available in the book. If you have more questions, please email service@shopmartingale.com. I am very impressed by the beautiful designs included in Sock Yarn Shawls II. I love how the book is broken into sections based on Shawl Size and the amount of yarn needed to reproduce the lovely designs. Six designs included only need one skein of sock yarn to complete! 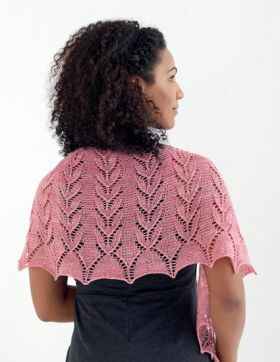 Each shawl pattern includes complete written instructions; some charted portions are included but the written instructions are also available for these if you do not like to follow charts. My favourite designs are: Lycopod, Daylily and Juniper. Jen's first book was a huge success. I love the fact that her patterns are both in written and chart format. confident when I can follow both. The brilliant thing about the book is it's for every level of knitter. From beginners to advanced knitters there is something for everyone. With 16 designs to choose from you are sure to find a design that you will love. Jen uses a basic colour and design to create something unique. Shawls are relaxing and fun to make. I think they make fantastic gifts. of sock-yarn, you can wear them any weather. or just wear them because they are beautiful. Jen's designs speak for themselves. I cannot state enough how fantastic these patterns are. This book offers you so much. in many different formats and designs. I know I'll be making quite a few as gifts for friends and family. They are so special I know that the gifts will be greatly received. I received a copy of the ebook to review, however all opinions expressed are my own and no monies were received. Recently I got my hands on Jen Lucas' newest book: Sock-Yarn Shawls II: 16 Patterns for Lace Knitting. I've spent the last two weeks with the book, reviewing patterns and sinking my teeth into the book, and I wanted to share my thoughts here. First off, the book is gorgeous. The clean and simple lines mean the focus is really on the patterns. 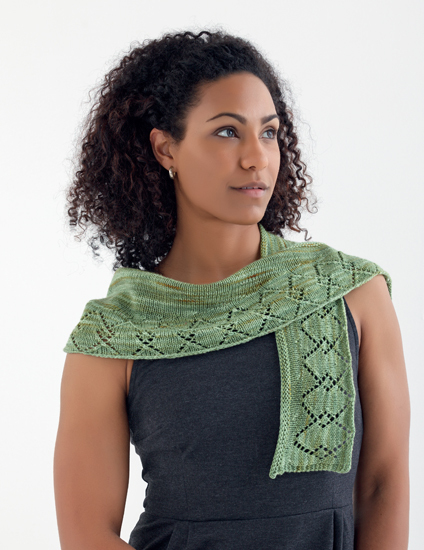 The book's model is also a POC, which is wonderful: all too often in the knitting world the models are of western descent. The book is divided into three sections: Small Shawls (featuring 6 designs), Midsize Shawls (featuring 7 designs), and Large Shawls (featuring 3 designs). While I would have liked one more larger shawl, I also have to admit that the larger shawls feature a LOT of knitting. 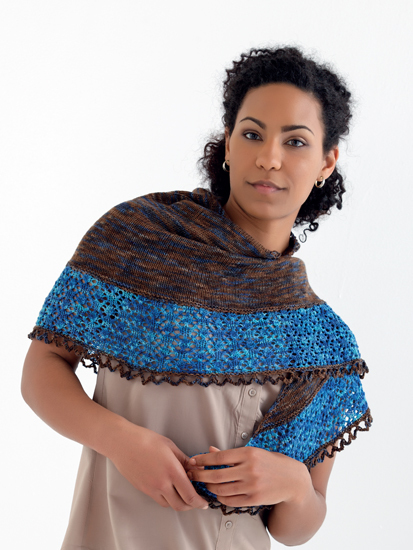 And several of the Midsize Shawls could have extra repeats to make them bigger. Overall, I think the spread and sample size is fairly balanced. 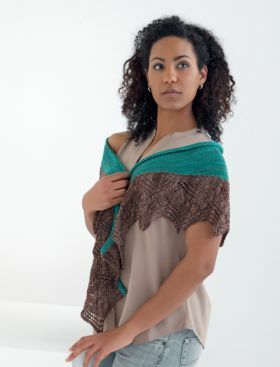 It is now time to declare my bias: I tend to prefer shawls that are solid most of the way through, with a lace edging. Allover lace patterns, while lovely, aren't generally my cup 'o tea, but I understand some people love them. My favorite patterns ended up being Sunburst, Earth and Sky, and Floe. 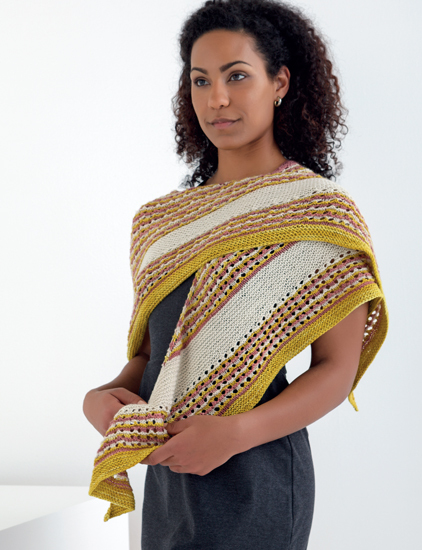 Still, the Lycopod, which is the pattern on the cover, is also gorgeous, and I'd think about modifying the shawl to suit my tastes. 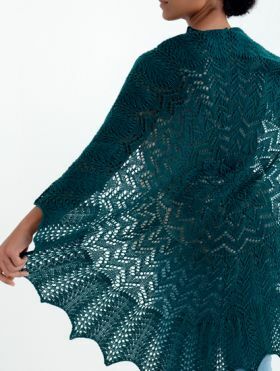 I love the amount of variability in shape and construction the shawls have. I also love how closely Jen's color taste aligns with my own. I also love how each pattern has some good close-up shots of the lace, to give you a really good sense of how the lace flows and looks. On a last note, how approachable is this book to someone who has never done a lace shawl before? The book has a lovely introduction on managing stitch markers (a must for lace knitting!). 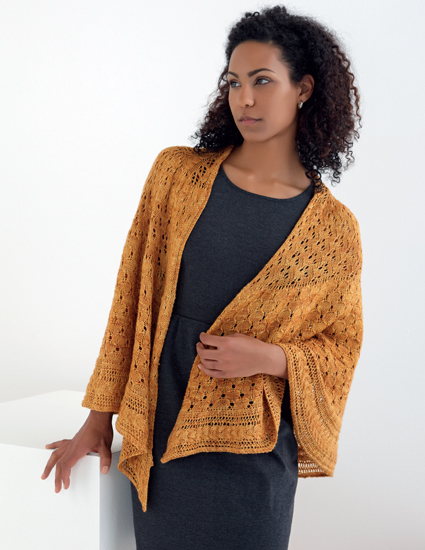 I do wish there'd been a mention of lifelines, considering there's a few different shawls I'd be tempted to use them on. However, lifelines are sometimes hard to explain concisely in pictures, so I could see how there might have been a page limit. There's also an excellent pictorial reference section, with good pictures on knitting a garter lace tab, and a few other helpful tutorials when working with lace. 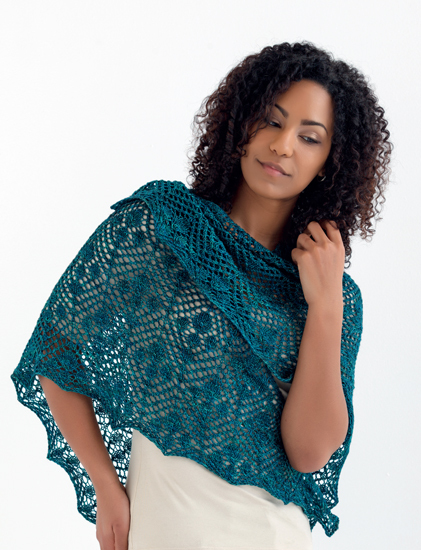 Some of the smaller shawls would definitely be approachable to beginners, and you could build on that success. 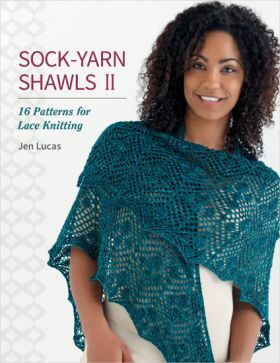 We all adore the original Sock-Yarn Shawls book, so we were thrilled to hear about the release of Jen's second book. Full of 16 beautiful lacy designs, this brand new book is another big hit! The patterns are divided into sections based on the amount of yarn they require, so they're perfect for using up those gorgeous hanks of sock yarn in your stash. 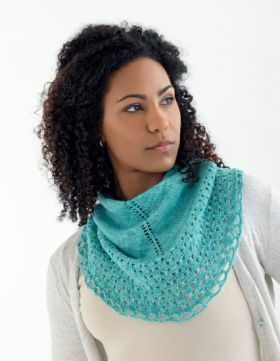 Knit a smaller shawl and wear it as a trendy kerchief, or make a large, show-stopping pi shawl to wow your fellow knitters. Jen Lucas has been knitting since 2004 and designing since 2008. Her designs have appeared in Interweave Knits, Knitscene, Love of Knitting, and other publications. A popular blogger and knitwear designer, Jen also enjoys crocheting, reading, and cooking. Visit her at JenLucasDesigns.com.